During the last eighteen months, First Presbyterian Church of Orlando has been in the process of evaluating our strategic direction and vision. As our church leaders continue to work to align our ministries to the mission of the church, we have had to make some difficult decisions regarding the future of several existing ministries under our care. As part of this process, the elders of our Session (the church’s governing board) made a decision to eliminate four existing ministries: The Magnolia Preschool, Fitness at First, MusikGarten, and FOUR12. Over the years, we have seen God use these ministries in transformative ways, and we are grateful for the season of ministry they have each sustained. We are thankful that we have been able to serve the city in these ways, but we must acknowledge the services we are providing no longer align with the church’s areas of focus in this season. This decision is not an easy one; it was made after much prayer and consideration, realizing that many people we care about would be affected. Mission alignment can be hard, but is a necessary activity for all healthy and forward-moving institutions. Another critical consideration for our church is stewardship: these ministries are supported through our budget, making them unsustainable in light of our new priorities. Every effort will be made to care for the staff directly affected by this transition. This decision by the Session in no way reflects upon the staff’s commitment, passion, or hard work. The Magnolia Preschool is scheduled to close in August of 2019. Knowing this change would be disruptive for our Magnolia families, we want to give as much time as possible to make preparations and help children transition well. In addition, we have a plan to assist The Magnolia Preschool staff and teachers with placement for future employment. Over the years, The Magnolia Preschool has provided a safe and loving school beginning for hundreds of children and their families, and we are grateful to have been able to serve the city in this way. Though we celebrate the ways God has used this ministry to care for families, we must acknowledge we can no longer sustain the operations of a full-time, year-round childcare model. When it was created over 40 years ago as the Infant Child Care Center, the school was designed to be a ministry-supported model and was a crucial way to serve Orlando’s working poor. Since then, both the clients we serve and the market for childcare in this city has changed dramatically. FOUR12 mentoring ministry has been in the process of transition for some months now, recognizing that the specific need for what we do after school has really already changed in the Mercy Drive community. During a specific season, FOUR12 met a very specific need in the Downtown and Mercy Drive communities. As schools and other local programs begun to engage students, offering greater incentives for participation in after-school programs like class credit, we have seen student involvement change. The great news is that students in the Mercy Drive neighborhood have more resources than ever to help them after school, and program leaders will work to help students make those connections with programs in their school or neighborhood. The program will wrap up in May 2019 at the close of the current school year. Musikgarten is music curriculum offered at hundreds of locations around the world. We have been grateful to host it on our campus for many years, and have seen the fruit of this kind of music education for young children. We are encouraged to know that Musikgarten will still be available for families in the Orlando community through their larger program. Musikgarten’s current semester will continue at the church through Spring 2019. The Fitness Center will continue operations until July 26, 2019. Fitness at First has provided a safe and non-judgemental community focused on health and fitness Downtown, and God has used it to help nurture people both physically and spiritually. As the church looks toward the future, the operations of a year-round, full-time fitness center on our campus are not sustainable. If you have questions about these changes, please reach out to the church directly at 407.423.3441, and one of our senior leaders or elders will speak with you personally. Often times I find myself frustrated by the hard truth that I cannot reach perfection. I cannot live perfect, I cannot act perfect, I cannot be perfect. Nothing done by my hands has the capacity to be without fault--it’s simply not in my DNA. I graduated from college with a degree in visual arts where I was reminded this hard truth every day. About a month and a half ago, I moved to Orlando and began working here at First Pres in the mission department. 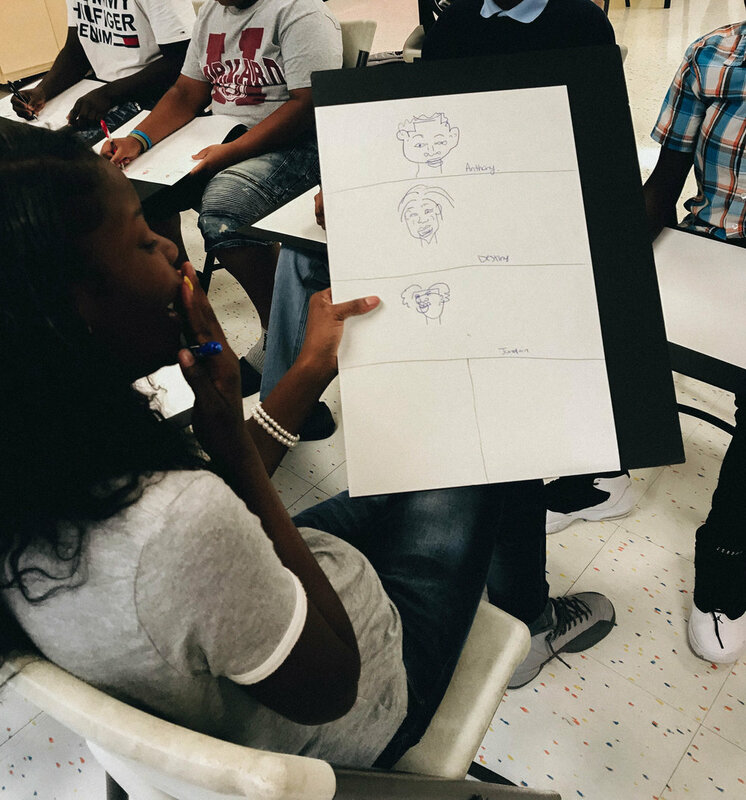 I’ve been serving as the Creative Coordinator for FOUR12, an afterschool program for middle and high school students. I was brought on board to teach students art with the hope that they would learn to see and create beauty in new ways. Every art project I have introduced so far has encouraged each student to embrace imperfection rather than live in fear of it. This is my mission statement as an artist- to lean into the messiness and mistakes that come from our human creation and learn from them. Earlier this month, I taught the group an art lesson that functions solely on this idea: blind contour portraits. The process is simple- you draw a portrait of the person sitting across from you without looking at your paper and never picking your pen up from the paper. If what you’re imagining in your head looks ridiculous, it’s because it is. That’s the whole point. 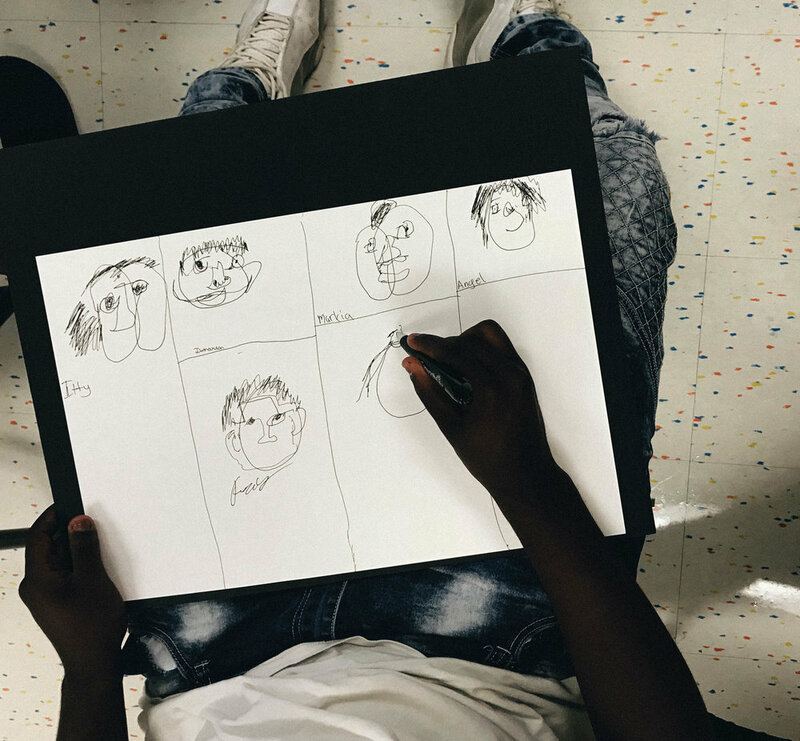 After being met with an understandable amount of resistance from the students towards drawing in this backwards way, they eventually began letting themselves be freed to play and make in accurate and imperfect portraits of each other. They began showing each other their drawings rather than hiding them because they “look bad”. Something that would have been a catalytic lesson for me in my teenage years would have been knowing that my brokenness and imperfection is not something that needs to be hidden. Not from my friends or classmates, not from my parents or teachers or mentors, and certainly not from God. Jesus died for me while I was a sinner, not while I was perfect. It would have changed my life if I had been told that striving for perfection means striving for an ever-moving finish line. My goal is to teach these students this truth of the gospel through the metaphor of art. Jesus doesn’t need them to be perfect, doesn’t need them to work in order to earn His love or forgiveness. He just needs them to claim what has already been given to them in Himself, and meets them exactly as they are-- imperfect, messy, funny-looking blind contour portraits. Last Fall, a small cohort of our FOUR12 students walked through Financial Peace University under the leadership of Eugenia Sefcik and Nancy Kirk! Together through the duration of the semester, they paid off $700 in debt, saved over $4,000, and cut up 3 credit cards. Many of these students have invited their friends to join them for the class this upcoming semester. We're looking to recruit financially savvy adults that are willing to mentor these students throughout the semester, including attending class on Monday nights at First Pres (starting September 10th), and reviewing their individual budgets. If you are interested in mentoring a FOUR12 student through this program, please let Alexa or Eugenia know! In 1978, Kanakuk Kamp recognized the need for urban youth to have a camp experience. As they continued to offer this opportunity the demand for this experience continued to grow until they realized they needed to do more. In 1991, the first Kids Across America Kamp was built and began hosting multiple weeks each summer for urban youth. Every summer we send a group of kids from our FOUR12 ministry to Kids Across America Kamp all the way in Missouri! There is plenty of fun and fellowship but most importantly, dozens of students give their lives to Christ, each year, during this week-long retreat! There are so many factors that go into getting a bunch of students halfway across the country but one of the biggest is the cost. Many of these families cannot afford a trip like this so we do our best to provide students the opportunity to earn their own money to pay for KAA! This Saturday we will be hosting another KAA Kar Wash at the Chick-Fil-A in Winter Park. We pick the students up bright and early (8am) on Saturday morning and they wash cars until 3pm! This is a wonderful way serve the students but also to give them dignity! KAA is something that they are passionate about and willing to work for. We have to remind ourselves that handouts can often do more harm than good. They can lead to the development of unhealthy dependence. They can implicitly teach the students that they aren’t capable of attaining their goal on their own. And it even cheapens the trip in some sense, if they are given it for free. All the money raised is divided evenly between the kids that served and it all goes to help pay for their trip to KAA! So join us as we serve our students by giving them the opportunity to go to Kamp! Come and get your car washed. Come meet some of these wonderful young people that we care about so deeply. Or even come and help us wash some cars! If you would like more info on KAA or FOUR12 we would love to connect you! Please get in touch with the wonderful Gayle Bosscher (gbosscher@fpco.org)! Cost: There is no set cost, rather we ask for donations. This past August, FOUR12, First Pres' student mentoring ministry, moved into the Northwest Community Center in the heart of the Mercy Drive Community. Since moving in, we've benefited greatly from being in the neighborhood we serve: our central location makes us far more accessible to both students and parents. In fact, we have seen more parental involvement in seven months than we’ve had in seven years, combined! Our students also have access to more amenities (gym, computer lab, & outdoor space) than ever before. We are grateful to the City of Orlando and the Northwest Community Center staff for such an amazing collaboration! PRAY. We have seen the power of prayer throughout our transition to Mercy Drive. Join with us in prayer each day for the vision and mission of the ministry; for our students, their families and the community; our leadership, volunteers, and board members. GIVE. As a mission partner of First Pres, approximately 60% of our budget comes from outside funding, which means we raise over $70,000 a year. The per capita income in the Mercy Drive Community is less than $10,000 per year. 40% of residents have only a high school diploma, and just 5% have a Bachelor’s degree. Sponsoring a student has a direct impact, giving them access to daily programming with trained staff, healthy snacks, tutoring, mentoring, retreats and camps. SERVE. Our students need caring adults to help them navigate and succeed. You can volunteer with us, any afternoon from 4-6pm. You can mentor weekly, serve as a guest speaker, or host a career exploration field trip. Just join in. SUPPORT. You can help support FOUR12 at our 3rd Annual Farm-to-Table Dinner. Get your tickets to this culinary event, which takes place April 28 at the Country Club of Orlando. Enjoy extraordinary food and party with a purpose. Learn more at myfour12.com or get involved by calling Gayle at 407.423.3441 x1291.